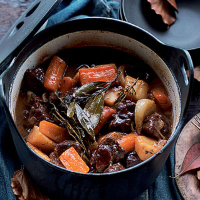 Choose a good, strong ale to give this rich, hearty, slow cooked casserole its delicious gravy. Preheat the oven to 170°C, gas mark 3. Place the flour either into a clean plastic food bag or onto a plate and season generously. Then, in batches, lightly dust the beef in the flour, shaking off any excess. Heat 1-2 tbsp of the oil in a large ovenproof and flameproof casserole dish with a lid. Fry the beef in 2-3 batches and cook for 1-2 minutes on each side, until browned all over. Transfer all the meat to a plate and set aside. Repeat with the remaining meat, adding more oil as needed. Heat the remaining oil in the empty pan and add the onions to the casserole dish with the carrots and parsnips. Sauté over a low heat for 5-6 minutes or until they are beginning to colour. Return the beef to the casserole, pour in the ale and stir occasionally until it reaches boiling point. Add the fresh thyme and the bay leaves. Cover and cook in the oven for 2-2½ hours, or until the meat and vegetables are very tender, then serve with Leek And Mustard Mash.